Sedlecky, M., Kvietková, M., Kubš, J., and Kubová, P. (2019). 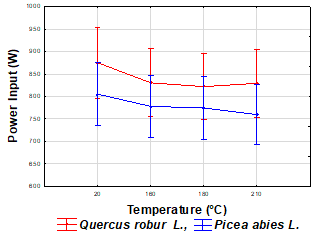 "The effect of milling parameters and thermal modification on power input during the milling of thermally modified spruce and oak wood," BioRes. 14(1), 669-687. 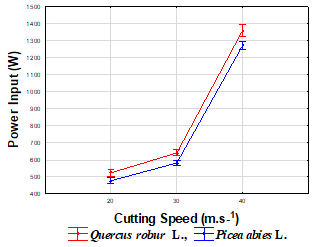 Effects of material, tool, and technological parameters were assessed during planar milling of thermally modified spruce (Picea abies L.) and oak (Quercus cerris L.) wood relative to the energy intensity of machining. The milling took place under the following conditions: cutting speeds of 20 m/s, 30 m/s, and 40 m/s; feed rates of 4 m/min, 8 m/min, and 11 m/min; and rake angles of 15 °, 20 °, and 25 °. Another change factor was the temperature of the thermal modification (20 °C – reference; 160 °C; 180 °C, and 210 °C). 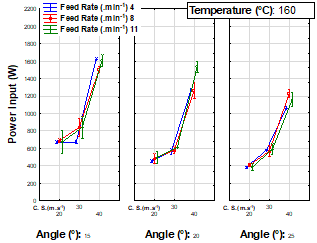 Each factor (cutting speed, rake angle, temperature, and feed rate) was found to have a statistically significant effect. The change in cutting speed had the greatest effect. The lowest power consumption was achieved with a cutting speed of 20 m/s, feed rate of 4 m/min, and rake angle of 25 °. In terms of thermal modification, thermally modified wood was machined with a lower power input. This result can be explained by the chemical processes in the wood and the reduced density in comparison with untreated wood. In comparison with density, the influence of changes in wood chemical composition did not have as great an impact on power input. Products obtained from the mechanical processing of wood have a number of advantages, but they also have deficiencies, such as changes in properties, inhomogeneous structure, anisotropy, presence of defects, shrinkage, and swelling. These drawbacks can be reduced to a certain extent by the thermal modification of wood, which is an environmentally friendly method (Niemz et al. 2010). This process can increase the material’s lifetime by up to three times. The whole process of thermal modification of wood, almost as it is performed today, was described in the 1920s. Currently, the thermal treatment of wood is carried out in an industrially controlled manner in order to extend the wood’s service life. Modified wood has increased durability, better dimensional stability, lower hygroscopicity, mild changes to mechanical properties, color changes to darker shades, and improved technological properties (Reinprecht and Vidholdová 2008). The production of thermally modified wood can elegantly substitute for the logging of exotic wood species in tropical and subtropical forests by the usage of heat-treated wood from temperate forests. On a worldwide scale, such wood is becoming more and more prominent as a very attractive, aesthetic, and pleasant natural material. All wood treatment temperatures above 100 °C, but mostly in the range of 150 °C to 170 °C, cause changes in chemical structure, and these changes are subsequently reflected in changes in the physical and mechanical properties (Gündüz et al. 2008; Kačíková et al. 2013; Pelit et al. 2014). With the ever-increasing consumption of thermally modified wood, it comes into contact with the most basic wood machining operations, including milling. Milling is the machining of material with a rotating tool (milling head and milling cutter) in order to remove material. The material is milled to obtain a high-quality surface as well as exact dimensions of the workpiece, which is important for further processing (rotary, planar, or shaped surfaces) (Welzbacher et al. 2011; Kvietková 2015). This process of machining is characterized by being a chip-forming process in which the chip thickness changes from minimum to maximum, or vice versa (Lisičan 1996; Bekéš et al. 1999). The chip thickness varies from h = 0 to hmax < fz ; the chip profile is shown in Fig. 1. Due to the circular rotary motion of the cutting edge and the blade, and the straight, uniform motion of the workpiece, the final motion of the cutting blade is cycloid (Lisičan 1996; Kvietková et al. 2015b; Mračková et al. 2016; Sikora et al. 2018). Each time wood is processed by a machine, it is very important to assess the energy intensity of the machining process. The energy consumption of machinery is reflected in the total price of the resulting product as well as in the resulting quality of the machined surface (Gaff et al. 2016). The goal of each manufacturer is to minimize production costs, and a suitable choice of cutting material, cutting edge angle, and optimum cutting conditions reduce these costs (Goglia 1994; Kvietková et al. 2015a). The cutting force is an important parameter for machinery, especially in terms of energy intensity. This parameter determines the cost of energy and the load on the electrical grid (Goglia 1994). When evaluating the energy intensity of machines in wood machining, one recognizes the terms power input and power output. Power input is a very important parameter that is needed to determine the energy costs, such as for sizing the electrical grid required for the machine. The power input of an engine, Pp, is defined as the product of the voltage, current, and effect of the cosφ, i.e., the amount of power of the machine derived from the electrical grid. The required cutting power of a machine, Pc, is the power required to develop the cutting force necessary to separate the chip from the material during the given technological operation, i.e., the amount of work released in one second (Barcík and Homola 2004; Gašparík and Gaff 2015a,b). The goal of this study was to find the optimal setting of the individual factors for the best possible energy consumption while maintaining the required quality and processing speed. Two wood species that are commonly used in the Czech Republic and around the world were selected for machining: spruce (Picea abies L.), as the representative of the most commonly used coniferous wood species, and oak (Quercus robur L.), as the representative of the most commonly used deciduous tree species. The material was treated at three different temperatures (160 °C, 180 °C, and 210 °C) by thermal modification (Fig. 2 and Fig. 3); reference samples of untreated spruce and oak, denoted as 20 °C, were added for comparison. From each wood species there were four samples 20 °C (untreated), 160 °C, 180 °C, and 210 °C. The KATRES chamber (Říčany, Czech Republic), which was made to order, was used for thermal modification. It is a smaller chamber for thermowood production. The dimensions of the samples for planar milling were 450 mm × 100 mm × 18 mm. Samples were placed in a conditioning room for two weeks (ϕ= 65±3% relative humidity and temperature t=20± 2°C). The milling blade used to machine the material was made of high-grade class 19 steel with the following elements added: C, 0.7%; Cr, 4.2 %; W, 18 %, and V, 1.5 %. The tool hardness was 62 HRC. The tool dimensions were as follows: blade angle (β) = 45°; cutting edge length = 45 mm; and blade thickness = 6 mm. For each of 216 measurement was used an unused cutting edge. where D is the diameter (unit), and n is the spindle speed (unit·s-1). The two-headed milling head was manufactured by STATON (Turany, Slovakia) in 2004. The diameter of each head was 125 mm, and the diameter of the clamping hole was 30 mm. The length of the blade was 45 mm. 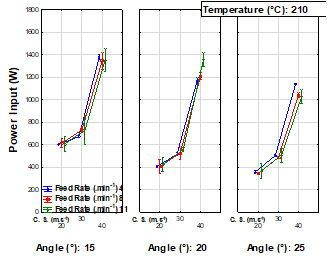 Three heads were used, each for a different rake angle (γ = 15°, 20°, and 25°). 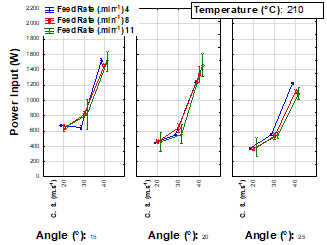 When the parameter variables are summarized (rake angle: 15°, 20°, and 25°; cutting speed: 20 m·s-1, 30 m·s-1, and 40 m·s-1; feed rate: 4 m·min-1, 8 m·min-1, and 11 m·min-1; and temperature: 20 °C, 160 °C, 180 °C, and 210 °C), the result is 108 measurements per tree species, for a total of 216 measurements. The power input during milling was measured using the METREL Power Q plus MI2392 device (METREL D.D., Horjul, Slovenia). This device measures the power input (W) and records an average value every second. To describe the effect of individual parameters on the power input, Duncan’s test and a graphical evaluation of the synergistic effects of factors in both examined tree species were used. ANOVA was used to compare the effects of the tree species on individual factors. The published results of Gaff et al. (2017a, b) were used; the chemical composition of these thermally modified trees was used to determine its effect on the power input. The Spearman’s correlation was used to evaluate the effect of chemical composition. The density of each wood sample was determined according to ISO 13061-2 (2014). where Q is the [The ratio of the change in the evaluated characteristic to the percentage change of Chemical Characteristics (W/%)] P is the power input (W), Ch is the chemical characteristic of the material (%). P20 is the power input (W) for material not treated thermally and Pther is the power input (W) for materials thermally modified at 160 °C, 180 °C, and 210 °C. Similarly, Ch20 is the chemical characteristic before thermal modification and Chther is the chemical characteristic after thermal modification. The average values of each component of wood substance (extractives, lignin, holocellulose, cellulose, and hemicelluloses) were entered for Chther. The density of each individual milled sample was determined according to ISO 13061-2 (2014); all values are listed in Table 1. 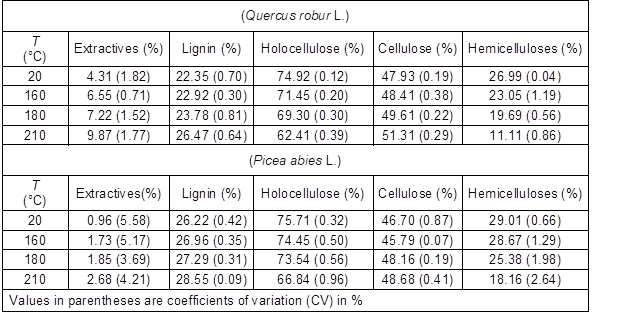 Table 2 shows the average values of the chemical characteristics with coefficients of variation for the relevant results. 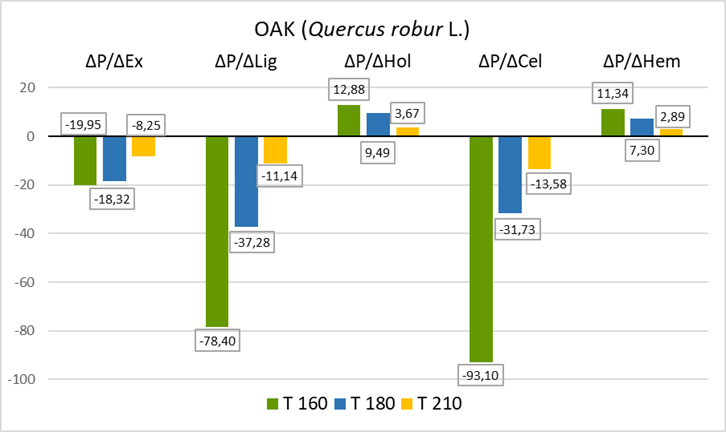 Table 3 shows that all of the monitored factors and their interactions in oak wood had a statistically significant effect on the power input. According to Fisher’s F-Test, the most important factor was the cutting speed. 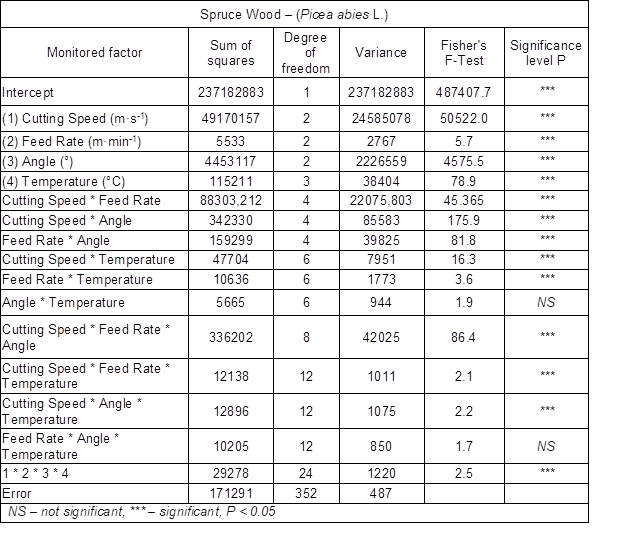 In spruce wood, the statistical significance of the effect of individual factors (1; 2; 3; and 4) on the power input was confirmed (Table 4). 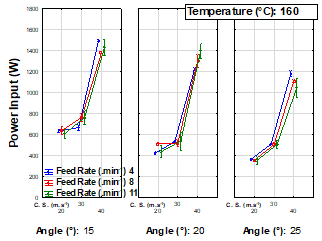 Regarding interactions between factors it was not possible to say with 95% confidence that the angle * temperature and the feed rate * angle * temperature affected the power input. Figure 4 shows the effect of the cutting speed on power input. The power input for machining oak wood was higher than that for machining spruce wood, with an average difference of 9.0%. This greater power input is due to the higher density of oak wood (Table 1) (Aguilera and Martin 2001). With both species, similar trends were observed. In oak wood, when the cutting speed increased from 20 m·s-1 to 30 m·s-1, the power input increased by 22.3%. With a further increase by the same value (i.e., by 10 m·s-1) from 30 m·s-1 to 40 m·s-1 , the power input increased by 112.2%. Similarly, in spruce wood the power input increased by 21.8% when the cutting speed was changed from 20 m·s-1 to 30 m·s-1. When the cutting speed was changed from 30 m·s-1 to 40 m·s-1, the power input increased by 118.7%. It has been repeatedly confirmed in the milling process that increasing the cutting speed increases the power input (Barcík et al. 2010). This effect is based on increasing the machine’s speed: to increase the speed, the power delivered to the machine needs to be increased. Figure 4 shows the effect of cutting speed on power input. For milling of oak wood, more power input is needed than for milling spruce wood. This is due to the higher density of oak wood. With increasing the cutting speed, the power input increased. When the cutting speed increased from 20 to 40 m·s-1, the power input increased by 160% for oak wood and 166% for spruce wood. A large increase from 30 to 40 m·s-1 was partly due to worsening of belt drive performance. Further, the power input increases due to increased machine speed. Figure 5 shows the effect of angle γ on the power input. In oak wood it was 7.4% higher than in spruce wood. Increasing the tool’s rake angle reduces the power input. 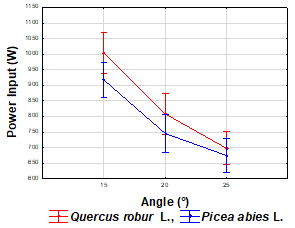 In oak wood the power input (at the angles 15°; 20°; and 25°) gradually decreased by 19.5% from angle 15° to 20° and 13.7% from angle 20° to 25°. 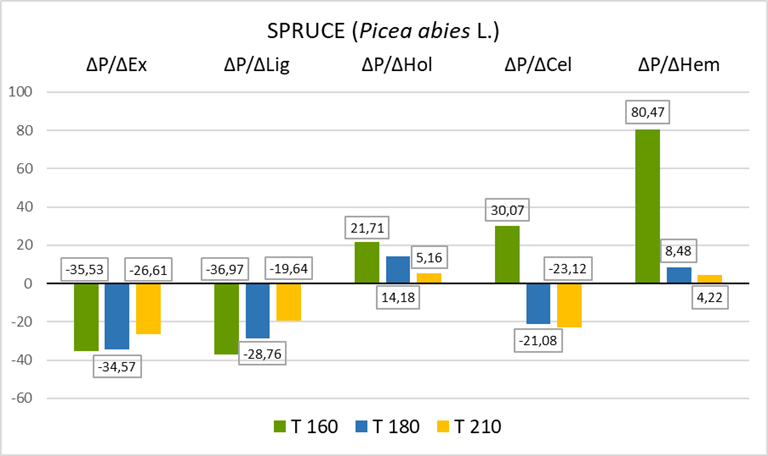 In spruce wood it decreased by 18.7% from angle 15° to 20° and 9.5% from angle 20° to 25°. In each monitored tree species an increase in the tool’s rake angle reduced the power input, as confirmed by other authors (Günay et al. 2005; Yanda et al. 2010). With increasing angle, the knife is easier to get into the material and can better remove the desired layer. 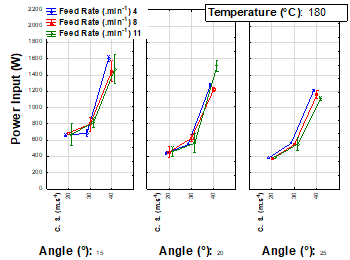 Figure 6 shows a graphical depiction of the effect of thermal modification on the power input. In oak wood the power input was 7.7% higher than that in spruce wood. The greatest decline was between thermally untreated wood and wood treated at 160 °C; in oak wood the decline was 5.1%, and in spruce wood the decline was 3.4%. Upon a further thermal modification temperature increase, there was only a slight change in the power input. In oak wood between 180 °C and 210 °C there was even an increase in power input (but only by 0.9%). In general, thermally modified wood requires less power input for machining than untreated wood. This trend was also confirmed in other studies (Wilkowski et al. 2011; Sedlecký and Gašparík 2017). The influence of thermal modification can be explained by the change in density that occurs during the thermal modification process. the change in density is not large enough to be strongly reflected in power input. 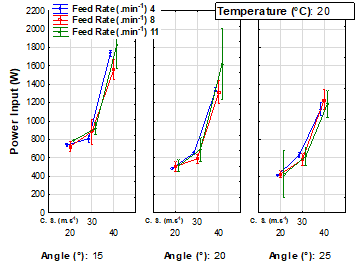 Figure 7 shows the effect of the feed rate on power input. Oak wood exhibited a higher power input than spruce wood, by 7.9% on average. As the feed rate increased, the power input also increased slowly. The highest increase was found in oak wood, in which the feed rate was changed from 8 m·min-1 to 11 m·min-1 (6.1%). Other changes occurred on the level of tenths of percentage. The increase in the power input reflected that the same amount of material must be removed in a shorter time. The same dependence was confirmed by Salca (2015), where the cutting power was measured during the machining of elder (Sambukus nigra), as well as in Durković et al. (2018). 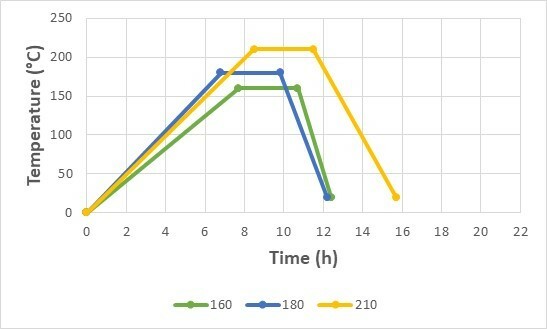 Figures 8, 9, 10, and 11 show the synergistic effects of individual parameters on the power input in the machining of oak wood. The course was almost identical in all cases. The power input dropped as the tool rake angle increased, and it increased as the cutting speed and feed rate increased. Table 5 shows that the cutting speed significantly affected the power input (P = 0.000). Another variable that significantly influenced the power input was the rake angle, in which the significance level was P = 0.000 at all angles (15 °, 20 °, and 25 °). In terms of the cutting speed, a significant effect was shown at 4 m·min-1 and 11 m·min-1, but with a change from 4 m·min-1 to 8 m·min-1, it cannot be said with 95% certainty that it significantly affected the power input. Upon evaluation of the thermal modification, it is clear that the thermally untreated wood significantly affected the resulting power input in comparison with the thermally treated wood. When the temperature of the thermal modification changed from 160 °C to 180 °C there was a statistical difference, but with a significance level of P = 0.037. When the thermal modification temperature increased from 160 °C and 180 °C to 210 °C, no statistically significant difference was demonstrated. As in Figs. 8, 9, 10, and 11, the course of values (power input) in spruce wood were similar, as oak wood, as can be seen in Figs. 12, 13, 14, and 15. These synergic dependencies show that the power input decreased as the tool rake angle increased. This course could be expected from other research findings (Krilek et al. 2014; Kubš et al. 2016; Durković et al. 2018). 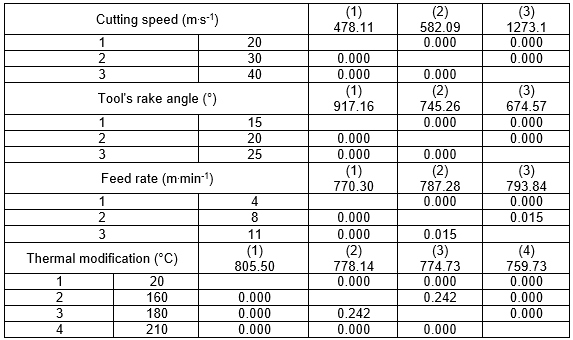 The optimal combination of individual factors in terms of energy intensity for oak wood, as can be seen from Table 5, is cutting speed 20 m.s-1, tool’s rake angle 25 °, and feed rate 4 m.min-1. 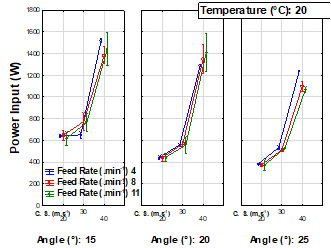 Table 6 shows the energy intensity (including average, standard deviation, and coefficient of variation) of the processes at different temperature modifications. At present, the average price per kWh in the Czech Republic is 0.16 EUR (Elektřina 2018). Table 7 shows that the cutting speed and the tool’s rake angle significantly affected the power input, with a significance level P = 0.000. 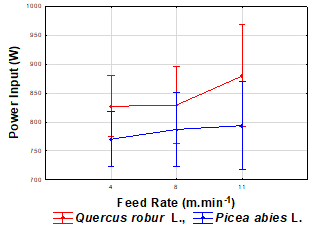 The feed rate had a statistically significant effect on the power input; it is also worth noting the decrease in the statistical significance between the feed rate change, from 8 m·min-1 to 11 m·min-1, in which the significance level was P = 0.015. The effect of the thermal modification on the power input evaluated by Duncan’s test showed a statistical significance (P = 0.000) for all values, except for a thermal modification temperature change from 160 °C to 180 °C. Figures 16 and 17 show the ratio of the differences in the power input and chemical characteristics according to Eq. 2, in which the differences between the chemical elements of wood (ΔEx; ΔLig; ΔHol; ΔCel; and ΔHem) were plotted for ΔCh. 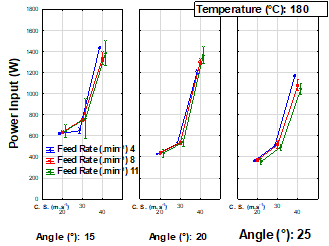 The individual graphs show how much the power input changes per unit of change in chemical characteristics in the difference between thermally untreated wood and wood thermally treated at 160 °C, 180 °C, and 210 °C. 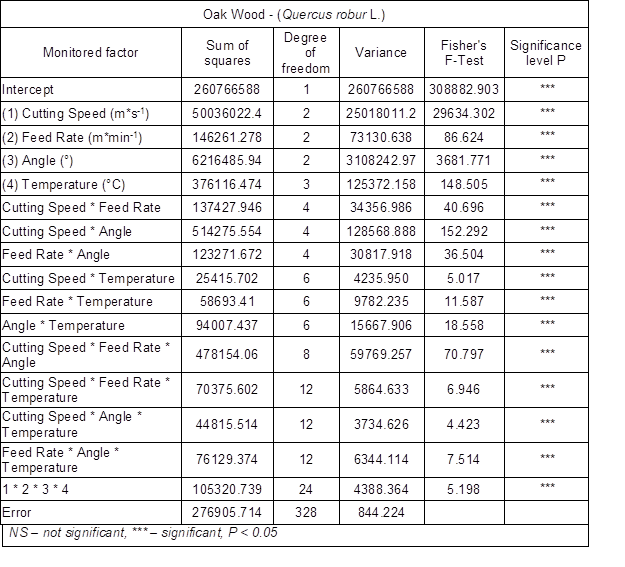 Based on Table 7, the optimal combination in terms of energy intensity was the same as oak wood, i.e. cutting speed 20 m.s-1, tool’s rake angle 25 °, feed rate 4 m·min-1. 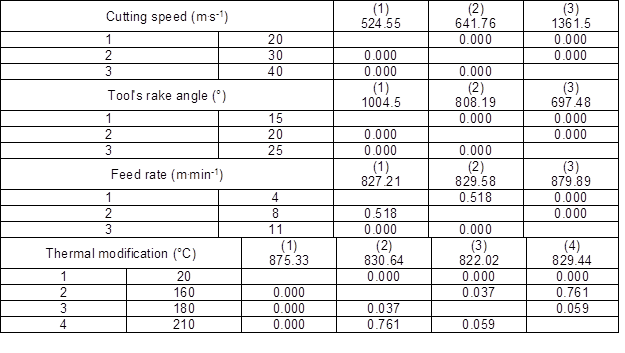 This combination in relation to four different temperature modifications is given in Table 8 for the calculation of the energy consumption and the total energy cost recalculated in 24 h.
The correlation coefficients shown in Tables 9 and 10, and in Figs. 16 and 17 show a very low degree of dependence between the chemical compounds and the power input in both assessed tree species. 1. Cutting speed was determined to have the most significant effect on power input in comparison to all the other monitored factors. In order to increase the cutting speed, one increases the machine speed, and the machine therefore consumes more energy. The increase in the power input when the cutting speed was increased from 20 m·s-1 to 40 m·s-1 was 166.3% for spruce wood and 159.6% for oak wood. 2. The effect of the tool’s rake angle was demonstrated to significantly affect the power input. According to Fisher’s F-Test (Tables 2 and 3), it was the second most important factor, as increasing the tool’s rake angle reduces the power input. The tool’s rake angle affects how easily the chip separates from the workpiece, how the chip starts to form, and the amount of power needed to penetrate the material. 3. The feed rate does not affect power input as significantly as the previous two assessed factors, but it is still statistically significant. As the feed rate increases, the power input also increases; this correlation is mainly due to the fact that the same amount of material needs to removed in less time. 4. Thermal modification was shown to have a statistically significant effect on the power input, but the course was not so unambiguous. This effect was mostly influenced by chemical processes in wood cutting and changes in density. When comparing thermally untreated wood and thermally treated wood, there was a decrease in the density, reducing the power input. 5. A comparison of both tree species has shown that more power is needed in the machining of oak, which is mainly based on the density of the material. In solid wood even the structure of the wood affects the power input required to machine a workpiece, but it is also largely reflected in the density. 6. The effect of the chemical composition of the two tree species was not significant according to Spearman’s correlation. The Spearman’s correlation coefficient was less than 8% for both tree species. However, the same dependence was observed for the individual wood components in both species. In holocellulose and hemicelluloses the power input increased as the percentage of these components in the wood increased; in the case of other components (extractives, lignin, and cellulose) the opposite applied. The authors are grateful for the support of “Advanced research supporting the forestry and wood-processing sector’s adaptation to global change and the 4th industrial revolution”, No. CZ.02.1.01/0.0/0.0/16_019/0000803 financed by OP RDE” and the University-wide Internal Grant Agency (CIGA) of the Faculty of Forestry and Wood Science at Czech University of Life Sciences Prague, Projects 2017 to 4306. Barcík, Š., Kminiak, R., Řehák, T., and Kvietková, M. (2010). “The influence of selected factors on energy requirements for plain milling of beech wood,” Journal of Forest Science 56(5), 243-250. Bekéš, J., Hrubec, J., Kicko, J., and Lipa, Z. (1999). Teória Obrábania [Theory of Machining], Slovenská Technická Univerzita, Bratislava, Slovakia. Elektřina (2018). “The price of electricity per kWh in 2018 jumped to 4.1 CZK,” (https://www.elektrina.cz/cena-elektriny-za-kwh-2018-cez-eon-pre-a-jini-dodavatele-elektriny). Accessed 3 October 2018. Gašparík, M., and Gaff, M. (2015a). “Influence of densification on bending strength of beech wood,” Wood Research 60(2), 211-218. Goglia, V. (1994). Strojevi i alati za obradu drva I. (Machines and Tools for Woodworking I. ), Šumarski fakultet Sveučilište u Zagrebu, Zagreb, Croatia (in Croatian). ISO 13061-2 (2014). 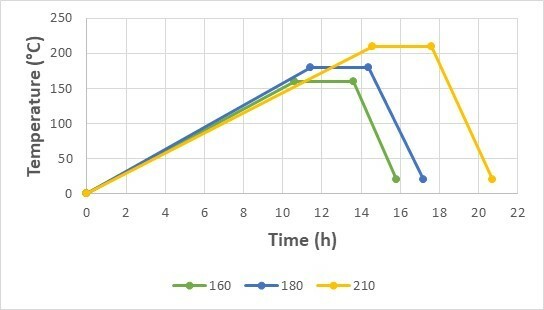 “Physical and mechanical properties of wood — Test methods for small clear wood specimens – Part 2: Determination of density for physical and mechanical tests,” International Organization for Standardization, Geneva, Switzerland. Reinprecht, L., and Vidholdová, Z. (2008). Termodrevo – Príprava, Vlastnosti a Aplikácie [ThermoWood – Preparing, Properties and Applications], Technical University in Zvolen, Slovakia (in Slovak). Yanda, H., Ghani, J. A., Hassan, C., and Haron, C. (2010). “Effect of rake angle on stress, strain and temperature on the edge of carbide cutting tool in orthogonal cutting using FEM simulation,” Journal of Engineering and Technological Sciences 42(2), 179-194. Article submitted: June 6, 2018; Peer review completed: July 28, 2018; Revised version received: November 20, 2018; Accepted: November 22, 2018; Published; December 3, 2018.